The Trumpington Game has been and gone over a couple of really entertaining evenings. Here is a summary of events ( from a German perspective). The start of the game commenced with a weather check. I had been hoping for poor weather, enough to keep the Home Guard inside the church hall and not particularly alert but not so bad that our Fallschirmjaeger would be scattered to all parts of the compass by strong winds. The die roll was favourable for the allies with good visibility and low wind. Whilst this did mean that all checkpoints and bunkers would be manned it also allowed us to plan the approach of the glider with some hope that the troops would actually land on the table. Private Pike even decided to keep lookout from his position on top of the church tower as opposed to reading his comic. Mad Peter took his alcohol test and staggered off towards the beach in order to call in the Kriegsmarine through signalling with his storm lantern. The Home Guard had strewn Farmer Giles' field with anti glider obstacles and a roaming herd of cows (of which more later). 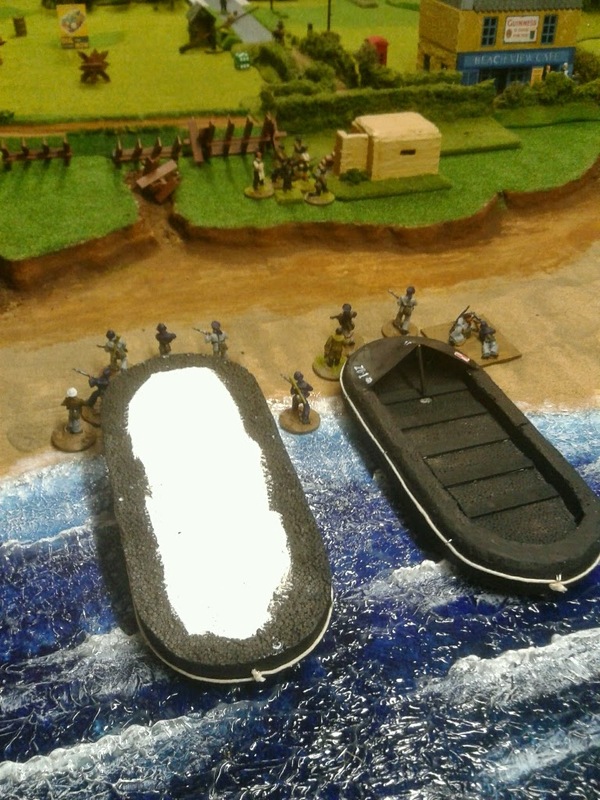 As Peter approaches the Beach a group of Fifth Columnists arrives along the Sea Road. Their job is to secure the Beach and hold it so that our assault troops can be evacuated. The Home Guard on exercise. Their ' random' patrol mainly consists of wandering towards the churchyard and then heading back to the Church Hall. I don't think they ever got out of the compound! On reaching the sand dunes Mad Peter misjudged the edge and falls head first onto the Beach. This delays the arrival of the Kriegsmarine and Peter has to be helped to his feet by the Fifth Columnists. Black Sam the Bootlegger arrives in a lorry with his gang intending to deliver contraband to the Beach View Guest House. He is stopped by PC Grabber. Unfortunately for PC Grabber he recognises the gang for who they are, is then overpowered, trussed up like a turkey and thrown in the back of the lorry. The lorry then changes direction and accelerates back along the High Street. Black Sam has been 'made' and decides to quit the seaside town. Confusion reigns. The lorry containing Black Sam almost rams the Metropolitan Police in their armoured van ' Holmes' as the bootleggers turn left from the High Street onto the Maldon Road. Slamming on the brakes they reverse at speed in the opposite direction and collide with a GPO van. Unbeknown to either the Police or the bootleggers the GPO crew are in fact traitors attempting to cut all the phone lines out of Trumpington. Pike looks on at the firefight between the Police and the bootleggers. All thoughts of an invasion or raid are forgotten as this sideshow plays out.. Meanwhile the Z-Boats arrive. Appalling conditions overturn one of the boats. Their experimental status is indicated by the fact that the undersized of the assault craft have not been painted ! 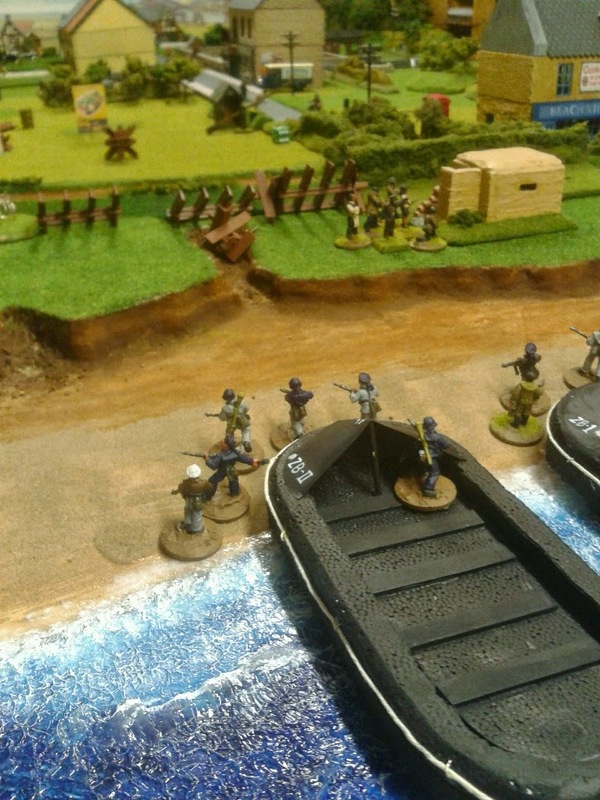 The Kriegsmarine finally make it to shore albeit wet and bedraggled. The fifth columnists have recovered Mad Peter from the sand dunes and have also found that the beachfront bunker is unoccupied. I live in Essex and have been gaming on and off since the 1970's. Married with three children, all of whom are growing up far too quickly.